Nonagenarian Jacob Jankowski reflects back on his wild and wondrous days with a circus. It’s the Depression Era and Jacob, finding himself parentless and penniless, joins the Benzini Brothers Most Spectacular Show on Earth. There he meets the freaks, grifters, and misfits that populate this world. He introduces us to Marlena, beautiful star of the equestrian act; to August, her charismatic but twisted husband (and the circus’s animal trainer); and to Rosie, the seemingly untrainable elephant Jacob cares for. Beautifully written, with a luminous sense of time and place, Water for Elephants tells of love in a world in which love’s a luxury few can afford. 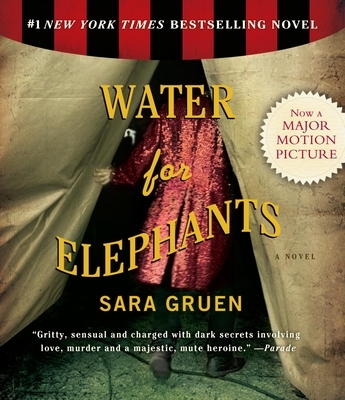 Sara Gruen is the #1 New York Times and USA Today bestselling author of At the Water’s Edge,Water for Elephants, Ape House, Riding Lessons, and Flying Changes. Her works have been translated into forty-three languages and have sold more than ten million copies worldwide. Water for Elephants was adapted into a major motion picture starring Reese Witherspoon, Rob Pattinson, and Christoph Waltz in 2011. She lives in western North Carolina with her husband and three sons, along with their dogs, cats, horses, birds, and the world’s fussiest goat. Stage and screen actor DAVID LEDOUX has lent his voice to several Audie® Award-nominated audiobooks.